Agastache foeniculum is an enthusiastic fragrant addition to the perennial garden. The Anise Hyssop will grow to 3 feet tall and wide. Agastache foeniculum produces its blue flowers from late Spring through most of the Summer. The Anise Hyssop can come back multiple seasons, older stems will need to be removed periodically as they weaken. Once the blooming season is completed I cut the plants off below the lowest blooming stalk. That is usually pretty close to the ground. Agastache foeniculum is hardy to temperatures far below what we are likely to see. 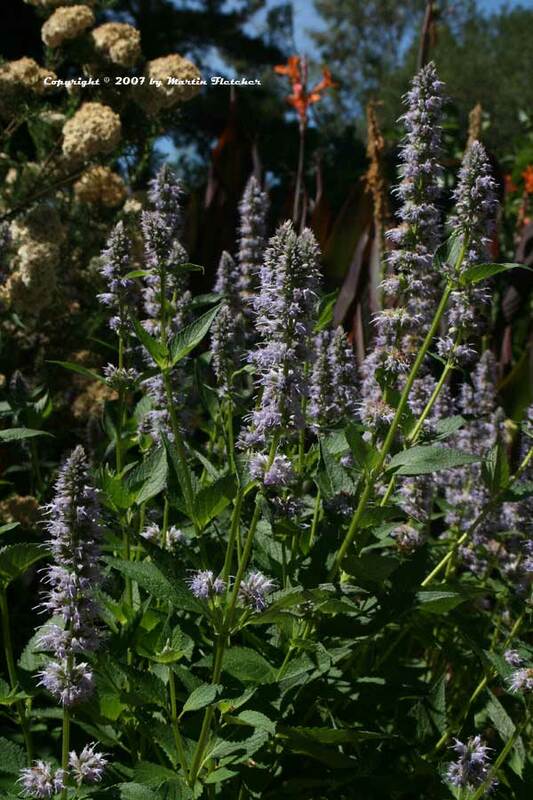 The Anise Hyssop prefers good soil and regular water. It is possible to over-water the Anise Hyssop, so don't plant these in a soggy section of the garden. Flowers and foliage of Agastache foeniculum the Anise Hyssop. High resolution photos are part of our garden image collection.